Attempting to teach an entire class how to count money and select denominations is difficult using old-fashioned methods. These generally involve pulling out a tray of fake money and holding up each bill or pinning it to the whiteboard as you try to teach them how to add it up. Teaching the class how to use coins can be even more difficult since these props are even smaller and harder to see. Although it’s always nice to use props, research shows students learn best when a variety of teaching methods are used. One such tool you could try is the whiteboard. Use the Gynzy Count With Money tool to display real images of money in extra-large sizes for your whole class to see. The tool allows you to select the type of currency you wish to work with—U.S. dollars, the Euro, Pounds Sterling, or Pesos—as well as the maximum generated value, currency denominations, and type of coins. It also allows you to either select the money yourself for your class to count or use the automated feature that provides you with a random amount of money with the click of a button. A ‘total’ button then lets you display the current total once your class has attempted to add it all together. 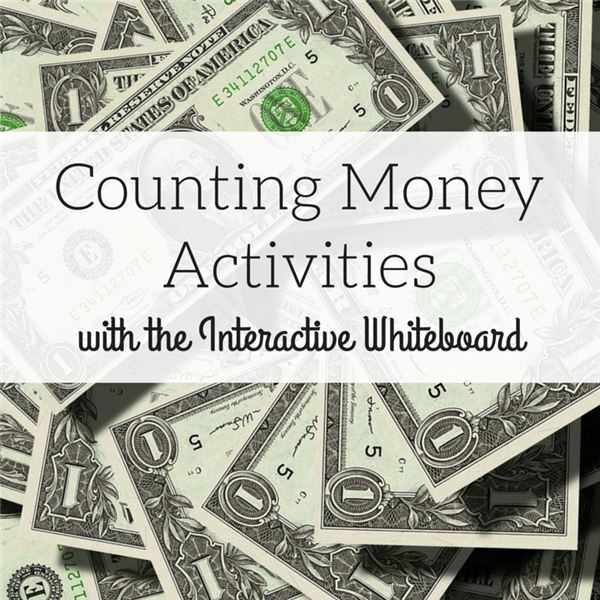 Instead of using printed worksheets with black and white copies of money, use the Count With Money smart board tool to test your students’ understanding of concepts. Since the tool allows you to display the money in color at the front of the class, it will be easier for them to distinguish between the different denominations. You can also use this tool to review the answers for the test once it’s finished. Just return the correct amount of currency to your whiteboard then count the sum together. For example, in U.S. dollars, you can help your class understand that it takes four $20 bills to equal $100. It takes two $10 bills to equal $20, two $5 bills to equal $10, and five $1 bills to equal $5. You can then show how many $10 bills it takes to make up a $100 and so on. Since the Gynzy tool allows you to display different denominations side by side, you can show exactly how many bills (or coins) are required to reach another denomination. Using the Gynzy Count With Money tool is also a great way to help your students understand counting by 5’s and 10’s. Simply display the desired bills and then point to each as you count together as a class. Since $2 bills (in U.S. currency) are also available, you can even help your class learn to count by 2’s. The opportunities to help your class succeed with currency and number patterns are almost endless when you use the Gynzy Count With Money tool in your daily lesson plans.